When Elton John sang that Mars is "cold as hell," he was right. It's a problem that has thrown a wrench in the works of geologists studying Martian gullies for the last three years. Mars is incredibly cold. Dry too. Thanks to low temperatures and an incredibly thin atmosphere, water left exposed on the Martian surface would immediately freeze and then sublimate directly into water vapor. It's been this way for a long, long time  perhaps billions of years. Phil Christensen says the gullies in the top right-center of this visible-light image, taken by the thermal emission imaging system on NASA's 2001 Mars Odyssey spacecraft, appear to emerge from beneath and within a gradually disappearing blanket of snow. The current snow pack in this crater (located at 43 degrees south, 214 degrees east) appears to remain only on the cold, pole-facing crater wall (top). On the less-shaded, warmer sides of the crater (left), the snow cover has completely disappeared, leaving the gullies exposed. Photo credit: NASA/JPL/Arizona State University. The dominant models of gulley formation that preceded Christensen's model relied on the runoff of subsurface aquifers and the melting of ice near the surface to carve the gullies. No model ever gained universal acceptance. In some key ways, the models were counterintuitive, Christensen says. They might work on warm days near the equator, but the gullies occur on isolated surfaces and seem to prefer Mars' colder mid-latitudes (between 30 and 70 degrees on both hemispheres). In these regions, groundwater seepage would be unexpected and unsheltered liquid water would not remain liquid for long. Snow, argues Christensen, is a different story. A layer of snow can provide protection  a localized greenhouse effect that allows snow several inches beneath the surface to melt while the snow above remains intact. Snow will melt here, even at temperatures well below freezing. After several thousand years of such melting a gulley would be carved by a trickle of snowmelt equivalent to a garden hose, and the snowpack removed. A currently accepted model predicts that up to about 10 meters of water-rich snow do in fact fall on the surface of Mars every 50,000 to 500,000 years, when the axis of Mars shifts and the ice from the polar caps is redistributed. 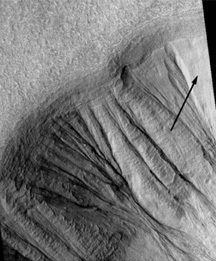 Christensen, head of ASU's Mars Space Flight Facility, says that pictures of Mars taken with the Mars Orbiter Camera (MOC) onboard NASA's Mars Global Surveyor spacecraft, and with his own Thermal Emission Imaging System (THEMIS) show remnant snowpacks that are still present along the edges of gullies and on crater walls. These snowpacks are essentially fossilized, buried underneath a thin layer of desiccated dust. Visible gullies in these same crater walls reveal places where the snow melted prior to burial. When Christensen looks at the two features side-by-side, he sees a weathering process frozen in time. The first time he noticed the snow in a MOC image, he realized its importance immediately. 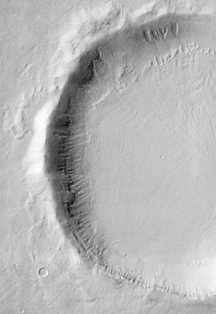 "The image shows a crater about 20 kilometer in diameter that on the pole-facing side has this 'pasted-on' terrain. As you come around to the west there are all these gullies. I saw it and said, 'Ah-ha!' It looks for all the world like these gullies are being exposed as this terrain is being removed through melting and evaporation." Planetary geologist Bruce Jakosky of the University of Colorado, Boulder, believes Christensen's explanation holds a lot of promise. "At present it is the best hypothesis going, both for the pasted on features and for the mechanism of supplying water to carve the gullies," Jakosky says. "It is at the top of the list in terms of plausibility and likelihood." He cautions, however, that the model is not yet completely proven. "There are still some substantial concerns I have about [Christensen's] model that can only be addressed through additional work looking into the physics of this model, as well as whether or not snowmelt is the only process involved." Christensen believes that melting is still occurring, provided there are still locations on Mars favorable to the process. Liquid water could be flowing on Mars today. Jakosky, while he doesn't disagree on this point, is not hopeful about the prospect of locating such a rarity. "I think identifying a place that might have liquid water today is going to be exceedingly difficult, if not impossible, short of just going to each snowpack and drilling to see if it is the one," Jakosky says. As of yet, NASA is still considering ways to study and explore Martian snowpacks.